Specifically this book. It's big enough to clobber people with. What's it about ? Well, once upon a time philosophy and science were the best of friends. They went everywhere together. They played together. They solved problems together. Hell, they discovered logic together. Really, it was one of the most adorable things you've ever seen. But something went badly wrong. Philosophy and science grew more and more distant. Science kept telling philosophy that it wasn't doing anything useful any more. Philosophy accused science of forgetting its most basic principles. Things were said. Mistakes were made. Philosophy gets a very bad rap from a surprising number of prominent scientists and science advocates. I've never really understood why - it feels like cutting off your nose to spite your face. Trying to understand your own internal biases, the biases of other scientists, the reasons for those preferences, whether your methodology is correct or another would be more appropriate and why, whether the observed correlation could have an underlying cause, whether you're really ruled out a hypothesis or if it can be saved, if you should try and falsify a hypothesis or seek to prove it, what the implications of your research will be... these are all very basic philosophical questions. Ones you literally can't do proper science without asking, at least subconsciously. Thankfully, in my experience at least, most scientists are interested in these questions - regardless of what nonsense the TV scientists have to say about it. Philosophy's role in the day-to-day process of doing science cannot be overstated. But I'm not working my way (500 pages at present, out of 1700) through the complete works of Plato for hitherto unknown tips and tricks to get me ahead of my philistine competitors. Plato wasn't a scientist or even a natural philosopher : he was a metaphysician*, an ethical and political inquirer. So although many of his teachings are directly applicable to science, they also have much broader implications. And while it's true that studying philosophy is a way to understand logic, which is definitely important in science, reading Plato gives insights into far more than the basic principles of reasoning. It reveals a world of ruthless logic and irrational devotion, moral principles that are both inspiring and terrifying, thought processes that are sometimes simplistic and sometimes incredibly sophisticated - and often all this at the same time. Far more important than teaching what to think or even how to think, it reveals that there are entirely different ways to think - and leaves the reader to decide for themselves which, if any, is correct. That's some fairly heavy stuff, so let's start with some simple examples. Things that are directly relevant for the scientific, logical approach we take for granted today. In Plato's dialogue of the same name, Parmenides demonstrates that it's not enough to investigate if one idea is true. To fully examine the issue you should also consider the case that it's not true. Which is a running "theme" of Plato, in a sense - a superficial analysis is just not good enough. You need to think very deeply about whatever it is you're proposing, attack it from many directions and see if it stands up. Similarly, you should not assume you've found the correct explanation just because it works - another explanation might do an equally good job or even better. The point of dialogue is not to attack each other personally, or even to attack each other's ideas. Attacking ideas is only a component part of the real goal : to get at the truth. There's a peculiar idea in vogue at the moment that science can only falsify things and not prove them; not everyone agrees, myself included. 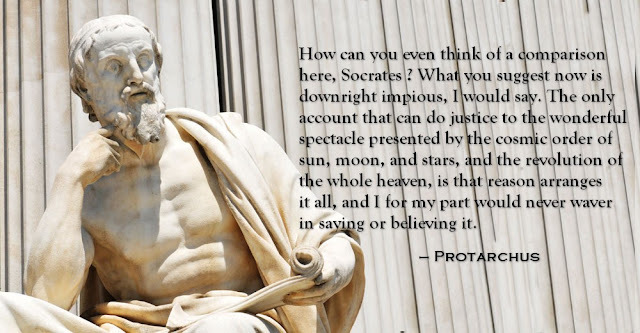 Plato took it for granted that the whole point of investigation was to understand how things actually are, not just keep chucking out wrong ideas. But there's a far more important point to the quote. Many of Plato's works are clearly set-pieces, using dialogue as a convenient way to expound his own views with a readable narrative. But others are far more earnest. Many don't establish a firm conclusion at all : the participants simply go away with a shrug, saying, "oh well, we've failed". There are probably several reasons Plato bothered to record such discussions. I suppose a few might be because he simply gave up, or never got around to finishing. But in at least some cases - the Apology purporting to be one of them - it seems that they are a fair approximation of a real discussion that actually took place. They certainly feel very earnest, a quality not easily expressed in a single quote or two - a genuine and sincere attempt to establish the truth. But still - the discussion fails, so why bother writing it down ? 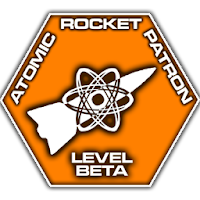 For future readers to build upon so they don't have to start from scratch ? Perhaps. But I think a far more important reason is because the process matters infinitely more than the conclusions. We often today use "talking shop" as derogatory, a means by which nothing will be accomplished. Plato makes a powerful case for talking shops as valuable in their own right. The dialogues encourage us not to reach conclusions so much as they simply inspire us to think. To examine an issue for its own sake, to exercise the mind and not let it go stale (to mix metaphors), is sufficiently its own reward. In that sense the discussions never fail. The second quality that the above quote hints at rather nicely is the nature of the discussion. Because the participants enter into the debate with the knowledge that they are after the truth and enjoy thinking for the pleasure of thinking, they are free to attack each other's ideas without mercy. They can be freely dismissed as absurd and ridiculous without fear of causing offence. The playful nature of the discussion is apparent on many occasions, and would have been much more so in the original Greek - Plato, it seemed, loved a good pun, though of course they're sadly lost in translation. Then there was that time in Theaetetus that Socrates opened a discussion by checking if his opponent was really as ugly as the rumours claimed. Or that eloquent speech in the Symposium where he essentially says, "I was deeply moved by your beautiful pack of lies." This absolute freedom to shoot down other ideas, even mock them, without the other person taking it personally - this is something that too often seems almost completely lost today. The notion that someone could be raising an idea just for the sake of discussing it, rather than it being their own pre-existing staunch conviction, is almost unheard of unless it's excessively, fawningly prefixed with "I'm just playing devil's advocate" or something similar - and even then we almost never really believe the person is sincere. Consequently when people change their minds during a discussion, they're seen as contradicting themselves, as being foolish and stupid even when they now profess to agree with us. The default is for one side to declare victory and continue attacking their opponent even after having won (especially common is to use their previous, retracted argument against them as evidence of their stupidity or poor moral character), rather than both sides rejoicing that they've found out something they didn't know before. In Plato's dialogues, having the courage of your pre-existing convictions is nowhere near as important as the courage to seek the truth and change your mind. That's the heart of it : you are free to consider any idea without anyone having the foolish notion that you actually believe it. You are merely entertaining it, exploring it for the sake of exploration. Of course, Plato certainly had his own convictions just like everyone else does, but the ideal of a dialogue as such a pure search for truth is no less potent for that. So it doesn't seem strange when Plato's characters freely criticise each others ideas or even their own ideas. Or when they point out some fundamental flaw or self-contradiction they've just spotted. The process is itself worthwhile whatever the outcome. I suppose that if Plato had access to a modern word processor, it's quite conceivable that he wouldn't have done it this way, that he'd have gone back and edited it. But I rather doubt it, and in case case who gives a damn ? Like the value of the process over the conclusions, the ideals of the technique are worth aspiring to regardless of whether the ancient philosophers really behaved like this or not. One of the common accusations levelled against Greek philosophers is that they were far too concerned with theory and didn't believe in observation. The idea goes that the Greeks believed that the senses could fool and deceive us, whereas the mind (or the soul) was above such petty corruptions. As such only pure reason could lead to truth, and it took the more practical Romans to actually do anything useful. Plato describes Socrates describing a "wise woman" who knew about sacrifices to avert the plague. Which immediately brought to mind the Wise Woman from Blackadder. 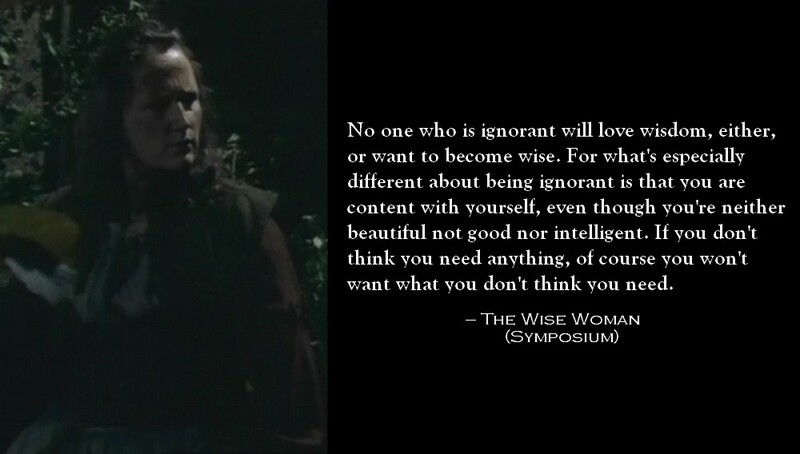 Yes I know this isn't the wise woman, but I don't care. My point is that Plato was not some ivory-tower intellectual sitting around thinking the whole day and knowing nothing of the real world. He pleads with his readers to ignore the pursuit of fame and fortune and to make self-examination - not blindly trusting his own conclusions - and the quest for self-improvement their goal above all others. This is spectacularly epitomised in the Apology : arguably one of the greatest works of human achievement in any field, ever. Seriously. I considered just copying and pasting the entire thing here, but I resisted. Though if you just want an executive summary, go here*. * "Apology" just derives from the Greek word for legal defence. That it contains not one word of actual apology is something that Plato, ever the fan of puns, would certainly have appreciated the irony of. There's much more of course. But the Apology deals almost exclusively with ethics, and here I'm trying to loosely concentrate on rational thinking. And yet... for all his exhortations to get his fellow citizens to think for themselves, Plato ultimately reached a conclusion that today looks very disturbing indeed. It's a running theme which appears again and again. 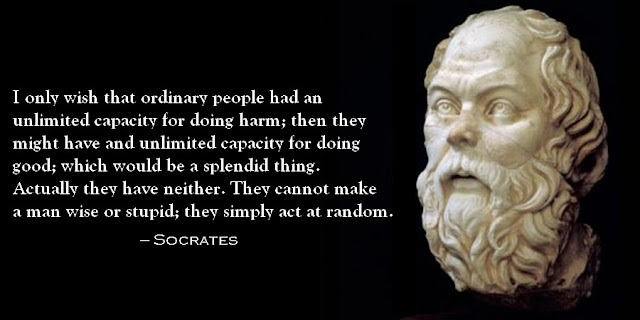 While we can never be certain if many of his quotes really came from the people in his writings, this one is such a constant that it's hard to believe it didn't originate from Plato himself. In one sense this can be seen in an entirely favourable light, if we allow for a minor change. Something that more expert people agree to is surely worthy more than something non expert people agree to, within the specified field of the experts. If this wasn't true, you'd have florists building particle accelerators and molecular biologists doing safety inspections on oil rigs : as far as establishing what the truth is, then of course it doesn't matter what the great unwashed think of it. How we should apply that truth is another matter entirely. But Plato often takes this very much further. Although he was aware that not everything should be taken to extremes, he did have a tendency to slip into this way of thinking. And this is one idea he develops to its full, terrifying potential in Republic. Kallipolis would be a state not merely run by its famous philosopher kings, but with everyone at every level of society with a single job to do, allotted them by committee. 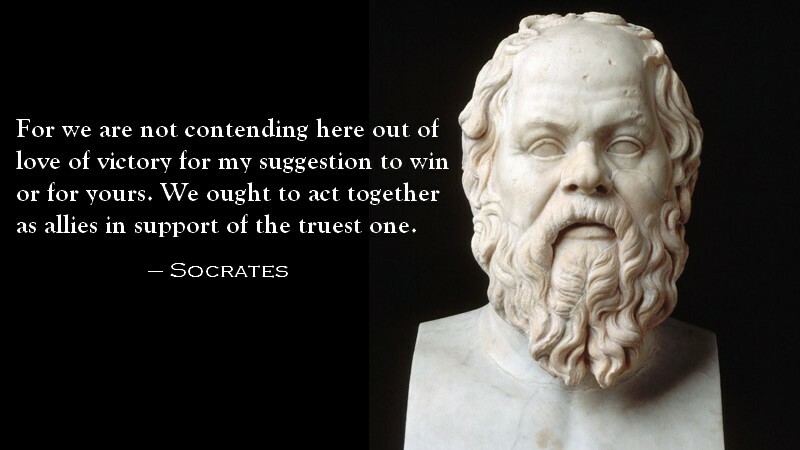 Since people (Plato reasoned) perform best when concentrating on a single job, everyone would have but one task for their entire lives that they would literally perform as best as humanly possible. It sounds bizarre and monstrous when you put it like that - and it is bizarre and monstrous - but what's really terrifying is just how damn reasonable, even benevolent, the whole thing sounds when you read Republic in full. 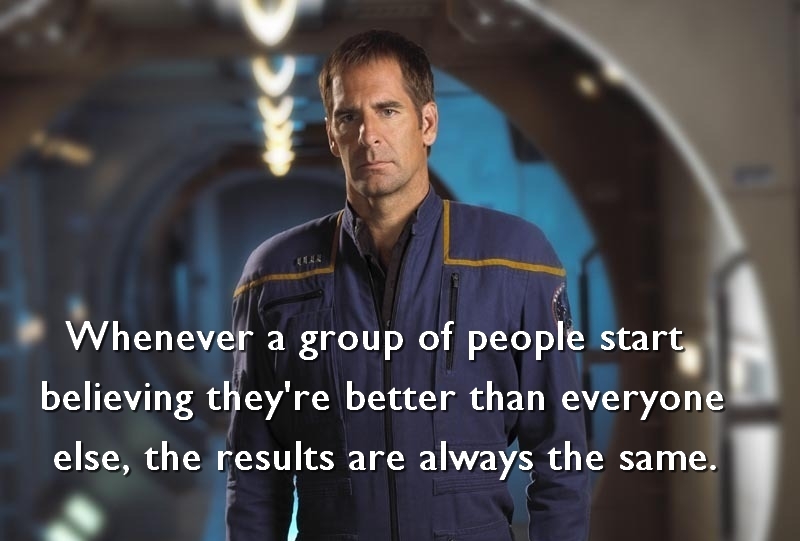 For example, if people aren't really "better" than other people, just different, then what the hell do we mean when we talk of self-improvement ? 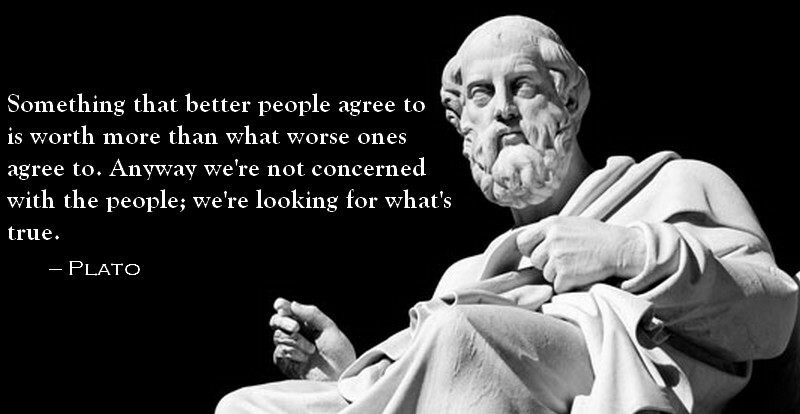 Plato, then, was just as flawed as the rest of us. The notion that some people are better at some things than other people slips so easily into the notion that some people are just better. It has thoroughly racist overtones, and Plato (thus far in my reading) didn't give the existence of slaves much pause for thought either. Could even Plato's genius eventually have salvaged this idea and turned it into something more moderate ? We'll never know, but as it stands the idea is certainly not worth defending. So the next quote I have to take from another source entirely. For all his wisdom, in this instance Plato had not subtlety. He surprisingly failed to consider another very basic property of human nature, one the writers of Futurama understood very well. But that doesn't mean he wasn't a rich, complex genius, and it would be rather small-minded of us to dismiss Plato's entire corpus because of this one idea. After all, he never had even any opportunity of putting his idea into practise - it was only ever an intellectual exercise. And it would be rather hypocritical to suggest that one of the best lessons of Plato is that we can merely entertain an idea without believing it, only to then use this one mad, offensive notion against him. Many of his other works are quite different in tone : playful, exploratory, far less certain, sometimes being explicitly much more concerned with methods of inquiry than conclusions. This is emphatically not someone who wants us to accept his conclusions as dogma. What's It All About, I Mean, Really, When You Get Right Down To It ? In his quest to uncover objective (though perhaps not absolute) ethical truths, Plato outlined many lessons important in the modern scientific method - some of which people tend to forget more than they should. But instead of applying these techniques to science itself, he used them to examine the even more important fields of ethics, psychology and metaphysics. Behind the dramatic flair of the Apology and the Symposium lies some incredibly sophisticated, complex thinking. For all that the conclusions of the dialogues are not so important as the method, if there was one thing Plato valued above all else it was surely rigour. If he came to a wrong conclusion, it was not because he hadn't tried damn hard to make his argument as waterproof and unassailable as possible (of course at his worst that means "rationalising" the argument, deliberately trying to logically justify it without ever really finding the truth). 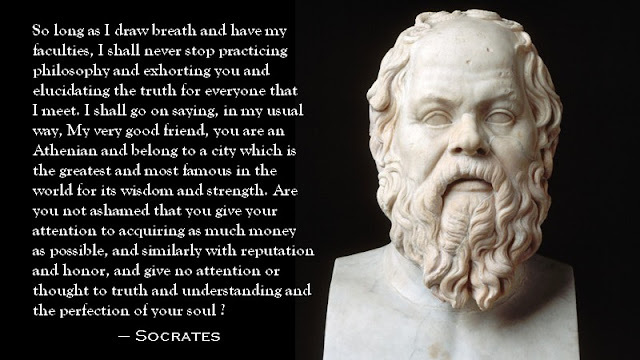 Socrates is famous for being pronounced as the wisest man because he alone knew his own ignorance, whereas everyone else thought they knew things they didn't : "I am wiser than he is to this small extent, that I do not think that I know what I do not know." But Plato is clear that this isn't supposed to be the limit of wisdom. 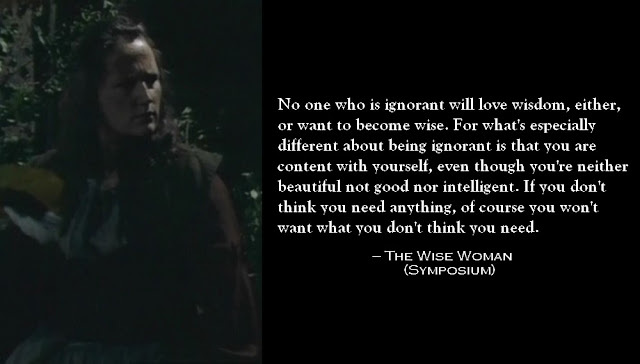 The purpose of knowing one's ignorance is so that you can entertain possibilities you wouldn't have otherwise considered, and to finally start learning. Sure, your conclusions might be wrong - but you have a duty to try and establish them as rigorously as possible. "Multitudes" hear not referring to people, simply numbers : he just means that quantifying things is a fundamentally good thing. "Names would have an absurd effect on the things they name, if they resembled them in every respect, since all of them would be duplicated, and no-one would be able to say which was the thing and which was the name." Think this is without any real-world consequences ? Perhaps it is for now... but it's been bugging the hell out of Star Trek fans for over fifty years. What comes out of a teleporter : is it you, or do you die and get replaced by a copy ? True, we still can't teleport people, and perhaps we never will. But quantum theory has particles "tunnelling" through barriers all the time. Are they the same particle that went in or "just" a copy ? What does identity really mean ? Philosophy, unlike science, is not constrained by observation and experiment : it can explore raw concepts. This makes it tremendously powerful, but also sometimes ferociously difficult... and extremely boring. 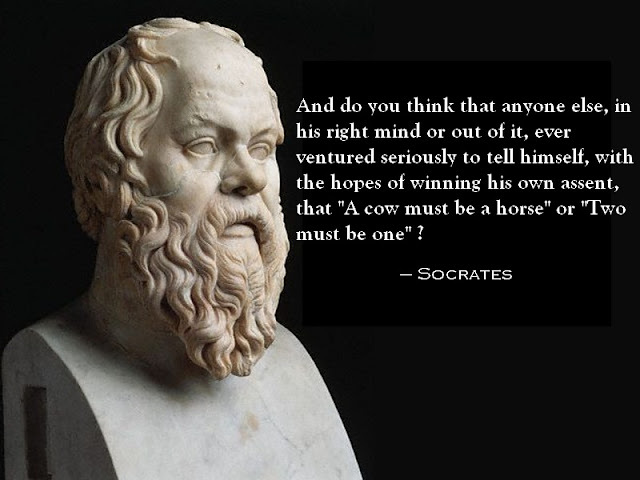 In Sophist Plato gets hung up on the bizarre idea that false knowledge is impossible - which he then tiresomely refutes. 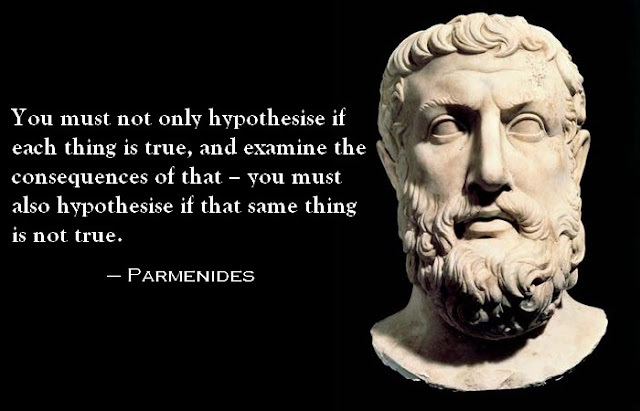 Parmenides is a particularly interesting but also incredibly tedious discussion on the nature of one. It's a tough piece. If I say I understand more than a fifth of it, I'm probably deceiving myself... yet I'd dare to venture that the main point is profound. While we often say that mathematics is the universal language, we don't often stop to think what that means. Language is how we describe the world. Mathematics is often held to be a more objective language, at least when coupled with observations, because numbers don't lie. But it's still a language, in Plato's view, with all the subjective problems that implies. Can you define a word without referring to other words ? Perhaps - in some cases. "Bird" is an easy one. But "justice" is not. In Parmenides we endure a frightfully laborious description of what "one" is. If we don't even understand that, how can we possibly claim to understand anything else ? And yet, perhaps we do. Perhaps language - mathematics included - simply invokes a deeper understanding within the brain : it's an abstract concept, but we all know what one is. True understanding may not come from verbal language or even mathematics, it's something ineffable. Plato's wise woman in the Symposium hints at that, noting that people can sometimes make correct judgements without being able to give a reason. Being able to articulate a thing (either mathematically, verbally, or otherwise) is not the same as understanding a thing, and vice-versa. Rather those expressions of a thing may only invoke that deeper understanding. When you think, do you think in sentences ? I do, most of the time. So my subconscious has already done the tricky part of assembling my true thoughts into intelligible sentences, putting one word ahead of another to form something that's usually coherent. Occasionally, especially with very difficult problems, it's possible to sense that deeper understanding falling into place more directly, an, "ohhhh" moment before a verbal description is possible. While for science we have to assume that mathematics is a language without the subjective flaws of poetry and literature, philosophy does not. It doesn't have to award mathematics the exalted position of giving a more meaningful description of reality. Mathematics may help us understand the world in a different way, but that's hardly true for most people. Personally I would say that raw numbers and equations are far less meaningful to me than a verbal description of a process. They can certainly be more useful, but that's not the same thing as meaning at all. If we take mathematics to be just another language - albeit a powerful one that opens up capabilities we would never have with other languages is - that changes the way we see the world. Mathematics is revealed to be full of abstract concepts just as much as the rest of language. Might we eventually find an even more powerful language that gives us the objectivity of mathematics with the clarity of meaning of ordinary dialect ? Time for another guest to intrude on Plato's moment of blog-based glory. 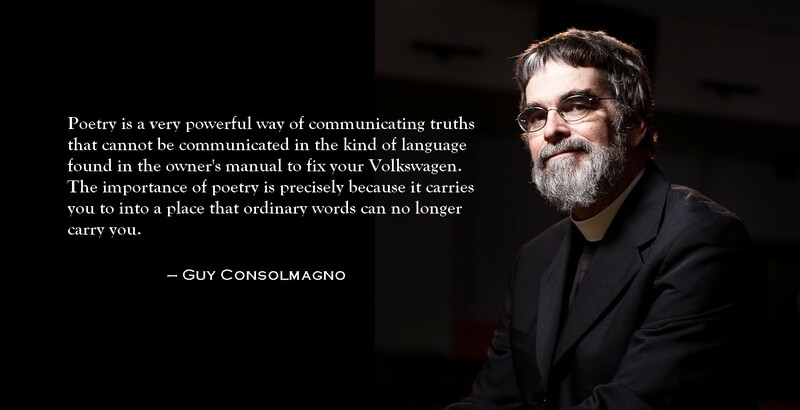 My point is that you can swap, "the kind of language you use to fix your Volkswagen" and "poetry" here and still have the statement hold true. If you read philosophy looking for answers, you're doing it wrong. If you judge an era exclusively by the standards of your own, you're doing it wrong too. Plato did propose answers, and many of them have stood the test of time - especially the methods of inquiry. But for all its similarities to modern Western culture - it was after all hugely influential in shaping the Western mindset - other aspects of this early culture are distinctly alien. Modern society struggles with homophobia; ancient Athens was extremely homophilic. For men to love other men was seen as far more manly. The Symposium features a long monologue in which the drunken Athenian general Alcibiades describes, basically, just how much he'd like to bone Socrates. In the Symposium, Pausanias even feels it necessary to state, "As a matter of fact, there should be a law forbidding affairs with young boys." To a modern scientist the notion that a mind could order reality, let alone would be necessary to maintain that order, looks extremely strange. It hasn't lost its hold over religious thinkers though, who take this to be true in varying degrees. Clearly there were very mixed feelings in ancient Athens towards questioning the gods. Theist or not, Plato seldom comes across as irrational, though many of his characters do. In any case he rarely gets bogged down in theological issues - in this instance deftly ignoring the central point as to whether reason orders the cosmos, choosing to turn his attentions to reason itself instead. So Plato reveals a world both very different and very similar to our own. His methods of discovering the the truth are not the only weapons at our disposal, but they are still every bit as relevant. His aim of discovering the truth is even more important : another theme wending through his work is that truth is not always as we might wish it, but we must seek it out even so. That is a lesson that it seems fundamentally difficult for many people to learn. Our society is not ancient Athens, and ancient Athens anyway wasn't the paragon of democracy and rationality that it's often made out to be - but that doesn't mean it doesn't have some valuable lessons to teach us. No-one sane would claim that out own society is perfect, but at least now it's an extreme minority who claim that slavery is perfectly natural, that war is virtuous, or take the principles of racial superiority for granted. We can either act with extreme cynicism and hypocrisy, dismissing the ancients as worthless even as our own society struggles with wealth inequality, double standards, discrimination and jingoism... or we can try and examine the past and learn from it - both from its mistakes and its wisdom. 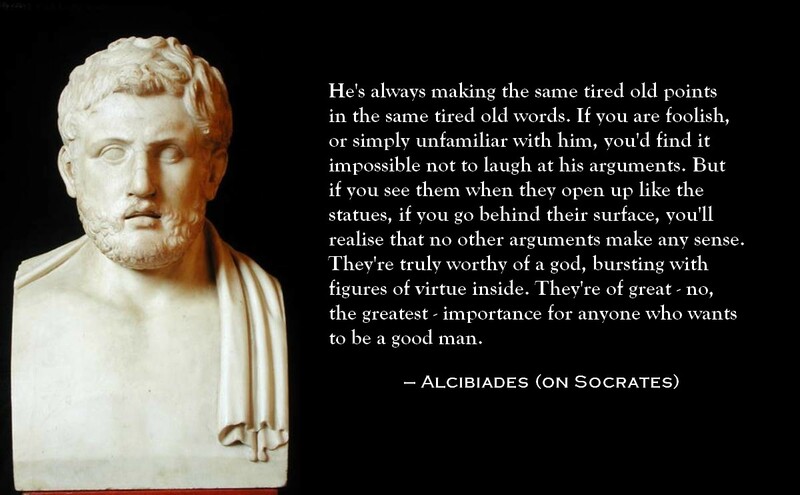 So I will end with how Alcibiades described Socrates, and advise you to apply this advice to this very quote. Don't look at the mere surface. Look deeper, search for meaning and interpretation, consider radical alternatives for the sheer joy of doing so. Think.